Getting to know southern Greenland means going beyond the Arctic frontier: a world which until now has been the home of the Inuit people, and which still holds on to the flavor of their traditional lifestyle. Southern Greenland offers the traveler the impact of a sea covered in icebergs and the awe-inspiring beauty of the glaciers overflowing into the tranquillity of the fjords. The landscape, with its intense green colors and leafy tundra and its colorful settlements, also provides character to this trip that makes the Arctic reachable for any adventure-minded traveler. On our route, we will be able to navigate through the fjords among blue-tinged icebergs and alongside spectacular glacier tongues. We will sleep in a camp located in a privileged setting, right next to a glacier. We will also have the opportunity to visit one of Inlandis's glaciers, and cover a small part of its immensity or enjoy an impressive kayak excursion among icebergs. We will be able to take spectacular treks through the tundra and in the glacier valleys, see herds of caribou and marine fauna, fish for Arctic salmon and codfish, gather mushrooms and cranberries. Along the way, we will get an insight into the story of the Norse settlers. Over the past 1000 years, Inuit and Viking cultures have shaped the people and land of South Greenland. The Qassiarsuk and Igaliku area in the region represent the most comprehensive and rich examples of Norse and Greenlandic farming culture. This unique heritage has been recently recognized and inscribed in the UNESCO World Heritage List. Flight Reykjavik (Domestic Airport) – Narsarsuaq. Kujataa Greenland: A Norse and Inuit farming landscape on the Edge of the Ice Cap. that Otto Frederiksen in 1924 established the first sheep farm after Igaliku, founding today’s settlement of Qassiarsuk. We will set off for Qaleraliq camp, navigating along Tunulliarfik fjord among numerous icebergs. We will stop at Narsaq to visit the third most populated town in South Greenland, with about 1500 inhabitants. Ascent to the base of Tasersuatsiaq great lake and panoramic view of the Inlandis. Ascent by foot through a unique desert-like sand valley which will lead us to a surprisingly different landscape, that of the green and thick tundra. After passing the lake, we will climb up a mountain 400 meters high, from which we will have a mesmerizing view of the lake, one of the largest in Southern Greenland. ice sheet up to the north coast of the island and towards the Arctic Ocean, and see the Nunataks, floating landmarks on the ice sheet. We may pick mushrooms and blueberries, and look for caribou, which are plentiful in the area. approach them along their more than 10 kilometres descent to the sea. labyrinthine quality to this glacier. the group during the trip, while he shares with us his knowledge about the special characteristics of the glaciers in the South of Greenland. A unique experience, exciting and original, surprising both first-time comers and those used to the peculiarities of the glacier world. 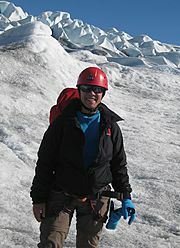 One of the most impressive sights and one of the best excursions in all Greenland. Navigation from Qaleraliq to Itilleq via the Tunulliarfik fjord. which is famous for being the most beautiful settlement in the whole Greenland, and where one finds: the ruins of Gardar, the archdiocese and religious capital of Viking Greenland, the Norse bishop’s farm – the largest in all of Greenland- and the setting of Anders Olsen’s farm, the unique architecture of the Igaliku stone houses. The area is recently declared part of the Unesco World Heritage List. After eating in Igaliku, return in the afternoon to Itilleq, and then to Qassiarsuk. On our way to Qassiarsuk, we will visit the Qooroq Fjord, where one of the most active glaciers in southern Greenland can be found, navigating to the area where iceberg density will make it impossible to carry on, and which is without doubt one of Greenland's best images. which is almost always blocked by the ice and icebergs coming from Eqaloruutsit glacier. was a Viking Settlement where we can discover some ruins. and the numerous icebergs covering it! We will discover lakes hidden in the tundra. Way back to Tasiusaq Farm. Later we can go fishing arctic salmon or for a walk in the region. best place in the whole Greenland. Accommodation in Tasiusaq or Qassiarsuk Hostel. We will cross to Narsarsuaq on our zodiac boat. Then, we will walk through Flower Valley enjoying the spectacular view of a valley formed due to the retreat and the consequent glacial sedimentation with plenty of flowers. We will walk until we can see Kiattut glacier and the landscape around it, with superb panoramic view of the ice sheet and its Nunataks. This is probably the most renowned excursion in all Greenland. Farewell dinner, with typical local Inuit products. plain and the Kiattut glacier. Flight Narsarsuaq – Reykjavik (domestic airport) or Copenhagen. Feel free to ask your local agency to privatize the tour if you would like to choose your own departure dates. Price per person, based on occupancy of one double room. Including international flights. Departure dates are guaranteed only if the minimum number of travelers per group is reached. Any other aspect not listed in “What is included"